Celebrate World Oceans Day on Guam! World Oceans Day is a global celebration of our planet’s oceans – a day to honor, protect, and conserve Earth’s most crucial resource. Our oceans generate most of the oxygen we breathe, help feed us and regulate our climate, and provide endless inspiration and rejuvenation. The ocean has been a vital part of the way of life on Guam for thousands of years. The Chamorro people are descendants of skilled and brave seafarers who relied on the ocean for food and medicine for centuries. Every year, over a million visitors from around the globe come to swim and dive in Guam’s clean warm waters. Here are some ways you can honor and celebrate the ocean during your visit to Guam. marine life from inside the Fisheye Underwater Observatory. fun activities that are also educational and informative. 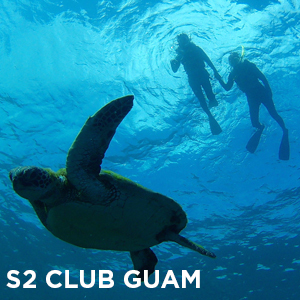 S2 Club Guam offers a special sea turtle experience, where guests can snorkel or dive in the open ocean alongside beautiful sea turtles in their natural habitat. It is a great opportunity to learn about the endangered species and ways you can help protect them. Breathing underwater and walking along the ocean floor is a thrilling experience that allows guests an up close look at hundreds of tropical fish. 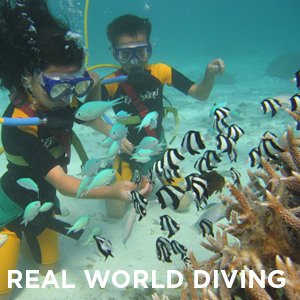 Real World Diving offers the Snuba experience in the Tumon Bay Marine Preserve, which allows guests to breathe underwater without having to carry an air tank. With Guam Seawalker, guests can experience helmet diving at the Piti Bomb Holes Marine Preserve. Helmet diving can also be experienced in Guam’s only walk-through tunnel aquarium, UnderWater World. There are many other marine sports and activities guests can experience on Guam including kayaking, sailing, and FlyBoard. For the ultimate marine adventure, learn how to scuba dive on Guam and even get your diving license in as few as two days. No matter where you live, you can celebrate and honor the oceans every day, including World Oceans Day on June 8.